AS I now have the units and thought some of you might be interested in a detailed discussion on the device. Well my two modules arrived yesterday and I quickly put together a circuit that I got from their application note on a breadboard and connected everything up in the lab and started to look at waveforms on the oscilloscope. See attached PDF's for specs and application notes. I have an email sent to the manufacturer asking for more detailed information and will post as/if I get any more documentation. There seems to be a constant 60hz 'at rest' output, which I originally thought was power supply noise, but then I realized that I am using a switcher so that ended that thought. 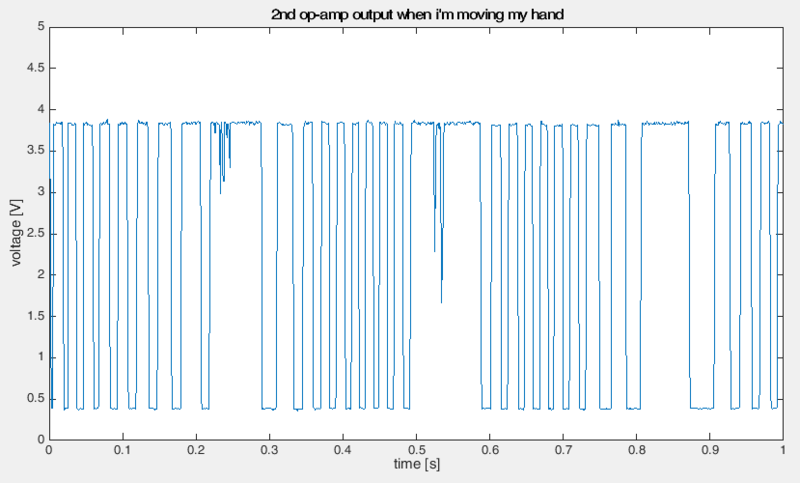 Moving my hand in front of the module I see the waveform change frequency in proportion to the movement. I then moved several feet away and the output continues to change, albeit not as obvious as when I was a few inches away. At twelve feet it was barely noticeable on the screen, but my eyes cannot see the waveforms well at that distance and at 25 feet I barely saw anything. Now, from the articles I have read online, and the few video clips I have watched, the output frequency is supposed to increase with the motion and speed, but my tests have shown the reverse and in some cases when you are very close to the unit the output 'saturates' and flat lines if the speed of movement is quite high. The online talks have said to connect the output stage of the pre-amp to an audio amplifier and speaker and listen to the output as it will go as high as 300hz to 450hz, but I have observed the frequency going lower than 60hz, with is usually falling between DC - 55hz. While this is not what I have found to be reported in other articles, for my purposes this will work just fine, but I will see what response, if any I get from the manufacurer says. As I said, I will chalk some of this up to my less than ideal test environment. In the meantime I think I will put together some code for a basic frequency counter using an AVR with a timer/counter being clocked on an external pin with a gate of one or two seconds to get an easier to read display. I will be outside with it later today and will report back any new findings. It will be interesting to hear your results. Do you have a tuning fork? Although a small, hand held tuning fork is apt to give a very low amplitude signal, due to its small size, and hence minimal reflected energy, it does give a fixed doppler shift signal, which can be useful for testing. Gotta love their app note. A "high Tech", GHz RF module, coupled to a 324 op-amp. :lol: Yes, and the performance sucked. I am thinking that they went with it because the frequency of the output is so low. I am hoping that the manufacturer can give me some insight because a DC - 60hz output is kind of low resolution in my book as there is not much deviation. It could also prove to be problematic as this thing may be installed near large motors, which the app sheet says could affect the device. More on that later. I did use the 324 at the start, hence why I can say the performance sucked. Then I switched over to a pair of OPA2703 op-amps and the signals were much better. Adding a third stage cleaned things up nicely. I will post a schematic of the circuit when I have some time. All of this is running off a single 5vdc supply just for details sake. You could lock a CD4046 pll to the output and monitor the vco control voltage. I will have to see if I have one laying around. Good idea. Going to take a trip to Radio shack and see if they have any in the drawer. Sometimes they do. Not holding my breath. The simple AVR frequency counter SORT of worked. I was able to read the output pretty accurately at rest and if I was real close to the HB100 the numbers did dance around nicely. But at 20 feet they were not moving as much as I liked, and at 40 feet I could see the scope screen changing but not the 7 segment readout very well. I tried changing the gate open time of the frequency counter to make the counter count a longer or shorter but that proved a non help. A one second gate time seemed to give the best results. I'm working on a similar project with the HB100 and I think I'm at the same point in the project as you. I built the reference filter/amplifier, then added a third stage to clean it up. I plan on adjusting values to shift the bandpass filters a little higher for my particular application. I'm also going to try dropping in another gain stage to see if it'll be useful or if I'm just amplifying noise at that point. I'd be interested in if you were able to solve the 40'+ sensitivity challenge. In my application I need good sensitivity to about 50' and I'm just not seeing it right now (same as you, 20' useful range). I'm starting to wonder if this little module just doesn't have the power needed for that kind of range. They do market it as an automatic door opener sensor, after all. I will post a schematic of the circuit when I have some time. This thread is what prompted me to join the site. A lot of good info here. Any chance you could post the schematic one of these days? I'd really like to see what you did for the third stage. Oh wow, I will have to look around for that box! Once I find it I will draw up the schematic and post. What I did find is that indeed the useful range for a human tracking is about twenty feet as we are soft material, covers on cloth which absorbs high frequencies. Now I had the rig setup outside and cars flying by at 50 to 75 feet were easily picked up as they flew by perpendicular to the module, and I could actually get a speed reading with the car headed straight at it for the most part. Another thing I found is that the unit is more omnidirectional than the data sheets plot shows. I could disrupt the unit by walking around behind it as far away as six feet and the unit would sense it. As I said I will have to look at what I did for he third stage. I do not remember if I added one more gain stage, which in think I did and was a mistake as the whole thing ran on 5vdc and you can only amplify so far. A better solution would be to add a comparator to clean up the output and square it up some. Thanks for the mental goose about this. Yes there is, and welcome to the community ! Sounds great! Looking forward to it. Your concern about the gain is something I hadn't thought about. So what makes a 2703 op-amp better than the suggested 324? Until now, I have only ever played around with 741s. The 2703 is a low noise, rail to rail op-amp meaning that it's output can swing very close to it's supply rails as opposed to the 324 which can only come within about 600mv of it's rails. In the case of a single supply, this relates to about 1.2 volts of output lost between Vcc and GND. This can be critical in battery powered designs for example. If you were testing indoors, the RF likely filled the room and was bouncing off the walls, several times. Therefore, even "behind" the unit, you were interfering with the RF energy waves. If you were outside, then this doesn't apply. It was outside. Open air. Not really. I looked at the board and what I did was add a third gain stage exactly like the second stage in the application note example, and then used the remaining op-amp as a voltage comparator to clean up the signal and keep it at a constant level that the AVR I had it attached to counting the pulses. Essentially from what my notes have in them the module does work as advertized at close range. The distance I needed the unit could not provide a big enough deviation to allow my code to discern from a baseline and a person. The reason for this is because people move real slow and clothing absorbs the radar waves. I had cars go past the thing at 50 to 75 feet at 40mph and the unit picked that up, and the code alarmed. As I noted before the unit can easily pick up movement behind it, and would cause false triggers all the time. I traded email back and forth with the units creator and a metal plate grounded to the modules power supply placed behind it reduced this interference dramatically. Over all this is a great device for anyone interested in getting their feet wet with radar sensing systems. In the right application this unit will work just fine. Too bad it was not mine thats all :? I ended up doing the same exact thing last weekend. Having never used a comparator before, I was pretty pleased with the results. I also added a voltage output, similiar to Limpkin's https://www.tindie.com/products/limpkin/hb100-doppler-module-with-backpack-1/ design. I also added an output before the comparator too, so it has three outputs. Not sure I'll need it, but thought I may not want to limit myself to only the comparator's output. Last night I mounted a 6" x 6" metal shield to the amplifier circuit's board, which cut down on false readings quite a bit. I'm considering boxing the sensor to further narrow the viewing angle. Hi Jim, I was imagining using something like a junked DBS dish. I would think that the focal point of the dish, being well into the far field of of the module's antenna would not cause any problems for the module itself. FWIW, Jim, I worked with microwave movement detectors (10.525GHz) in the late seventies. One common problem was that they detect flourescent lights as movement, that may be the source of your 60Hz output. Some of the movement detectors had a M-Sync Input which was used to drive some circuitry to reject the 50/100Hz signal from flourescent lamps. Do you have flourescent lighting? In the lab yes. In the field test no. THe field test was done in my driveway. Recently I became interested in building a 'radar speed gun', with a view to measuring traffic speed. Using an HB100 transceiver module seemed a good place to start. I have come across some of the same issues as others. Noise is a problem, especially irregular 'clicks' at about 20 ms intervals . This from within the HB100 I think as the data was collected outdoors under battery power. I too noticed the sensitivity to movement behind the sensor as well as in front (and laterally as well). I decided to attack the problem by constructing a parabolic reflector. I lined a polypropylene Christmas pudding basin with strips of adhesive aluminium foil and mounted the HB100 inside it (see attached picture). OK it's far from exactly parabolic and the module is not exactly at the focus, but it certainly makes the response much more directional and it cost very little, even less if you discount the cost of the pudding, which my wife and I ate. I stayed with the two stage LM324 op amp circuit but changed the feedback components to optimise amplification in the 300 to 3,000 Hz range (corresponding to roughly 10 mph to 100 mph) and reduced overall amplification a bit to avoid saturation. Before retirement my career was in software, so I was keen to get the data in digital form and be able to play with it with a processor. So I fed the amplifier output into a 12 bit analogue digital converter chip, driven from a Raspberry Pi. The Pi wrote the data to storage as a series of digital values and timestamps, sampling the signal at about 75 kHz. In the future I intend to do the data analysis on the Pi and display speed results on a 16x2 character lcd display, but so far I have attacked the data on my PC where it's quicker and easier to develop custom software, display results in Excel etc. inspect the data to obtain a long term average of the signal - this gives a 'zero point' about which the signal oscillates. apply smoothing to the data to take out some of the noise. I calculated the smoothed value for each sample as ((sample-2)*1 + (sample-1)*3 + sample*5 + (sample+1)*3 + (sample+2)*1)/13. work through the data looking for places where the smoothed value crosses the zero point. the time difference between the crossing point N and crossing point N-2 is the period of the signal. Because of the 'Linux problem' not all time values are accurate (i.e. the program may have been interrupted between measuring the value and reading the system timer). Crossing points were ignored if the time value of the previous sample was significantly longer ago than the 'usual' time observed between samples). 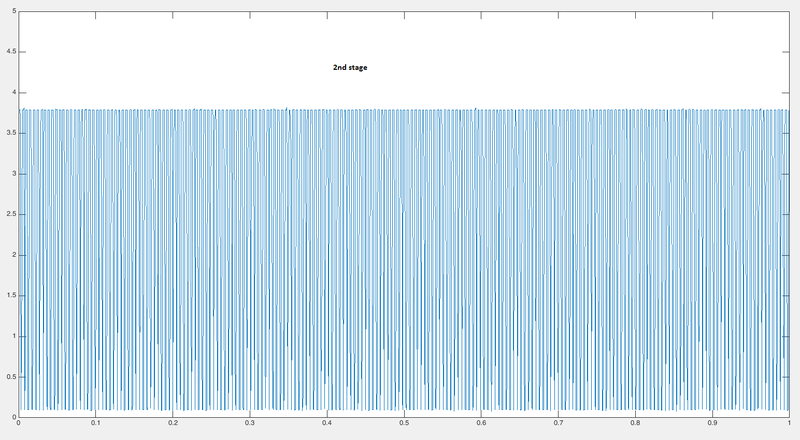 So you end up with a large number of values for the period of the signal. Each one was allocated to a 10 micro second duration bucket. After processing all the data you find only a few buckets have a significant sample count and they are closely grouped (see attachment) so it's easy to deduce the dominant period of the signal and its reciprocal is the signal frequency. Using the standard Doppler equation you can convert the frequency to a speed (see attachment). I like your summary. Holding a HB100 in my hand I have to admire you and your wife's dedication to science in eating such a large plum pudding, although you didn't say if it was in one sitting. However, probably an oversight, your results appear to indicate a speed of around 33 mph, but what was it really? And what was the "target"? How measured? (Head on? What range? etc, etc, etc). I love plum puddings but usually make them myself... I may have to create a parabolic shape in plaster of paris... hmm, thinking, thinking, thinking. Very interesting. I had not seen this thread, and wasn't aware of this HB100. A few years back, we had an app for "restaurant drive through" or similar (truck coming to yard gate) application. For vehicle detection, either ground loops or ultrasonic sensor used. Both have drawbacks. I thought of the "radar"-type modules such as used on automatic doors. But at the time, they were too pricey. But with this one -- hmmm. About $5 each to start. Can y'all tell me if this would be suitable for arrival of a vehicle, motorcycle or larger, a few feet in front of the drive-up speaker post? What about snowy/icy weather? (that is a bit of a problem with the ultrasonics) What is actually exposed to the weather? Does it work through a protective plastic/glass window? Edit: After poking around a bit on the 'Net, it appears that it might work well through a weather-protecting cover. And, if my guess is correct, once in position and calibrated for "no object present" that the output level (ignoring the frequency for speed detection) would change when "object present". The detector assembly was placed about 1m from the road edge, pointing along the road, which is straight. The data in my example was for a car moving away from the detector, on the same side of the road as the detector, and the measured speed of 33 mph is not unreasonable for this road (but perhaps a bit low, so the cosine effect may be significant). The road is about 5m wide. As the vehicle passed the detector it would have been about 1.5m to the side of the detector, moving at 90 degrees to the line of sight of the detector, then the angle would have decreased steadily until the vehicle was moving more or less directly away from the detector. The attached image gives an idea of the shape of the raw data. The image covers a period of about 1.2 seconds = 16m of travel at 30mph but my analysis only covered a part of this. I have yet to investigate whether I can detect the cosine effect in the measured speed as the vehicle changes distance from the detector. If it can be measured it could be compensated perhaps. There are many hours of fun left to have with this problem! In case it's of interest I have also attached the complete raw data csv for the case (about 5 sec of data). NB Unix style line endings. Each line contains a time stamp (in micro seconds) and ADC output value (0-4095). My two grown up children helped to deal with the pudding, which was flamed with rum then served with a white sauce (also dosed with rum). Very tasty! I've never worked with the HB100, but if I ever get some other items off my list it would certainly be an interesting device. Remember that if you enclose the module the enclosure needs to be maximally transparent and minimally reflective at 10.whatever GHz. You don't want to "contain" the signal inside the enclosure, and you don't want the signal bouncing back and forth in the enclosure. Two reasons for this, you want to maximize your transmitted signal so as to maximize the signal reflection back to the detector. Secondly, the "reverberations", (for lack of a better term), inside the enclosure will desensitize the receiver. Secondly, I think the two PCB microstrip antennas are on the non-module side of the PCB. It would be interesting to try the module and reflector setup again, with the antennas facing inwards, into the reflector, not outwards. The point, I think, of a parabolic reflector is to have a large opening facing the signal source, to "collect" as much RF energy as possible, and then focus the reflection on the antenna element. In theory, the size of the module is "very small" with respect to the size of the frontal opening of the parabolic antenna, and the RF energy it blocks is "negligible". As mounted now, the antenna is just picking up the incoming RF energy that hits the module. The parabolic reflector is simply acting as a shield to block out some of the off-axis signal. You are not getting any "Signal Gain" from the parabolic antenna in the current configuration. Thanks DocJC. Your comments are interesting and make a lot of sense. To avoid signal containment I could work with the polypropylene lid removed or replaced by cling film or thin polythene perhaps. Polypropylene is pretty transparent to microwaves I believe, but a layer of cling must surely be better. As for pointing the transducer the other way, I follow your argument. Getting some signal gain can only help matters, particularly if allows use at greater range and therefore smaller Doppler frequency reduction due to the cosine factor. It needs to be tried! looks much better for the job, but I've been quoted over £120 for one - nearly 40x more expensive than the HB100! There's an AVRfreak from Chanute Kansas. That's where the Kustom Dual Stalker radar gun used by the Florida Highway Patrol is made. There is a brochure on their site. It has a beam width of 6 degrees but I wonder if any radar engineers know how these things work. I have heard that they are calibrated with a tuning fork. Is it CW? Doppler? Regular old radar with a PRF? If so, it must have a 'blind' range that has a period that is a multiple of the PRF. So you could blow thru the trap at this achilles heel speed. They might design it to be 200mph. Only a Lambo could bust the trap. Not the link I was looking for, but still an interesting one. I always thought it was Doppler, Bob, but could be wrong. It would fit with the tuning fork thing. Doc's link above talks about doppler radar guns. Right you are. I think I was thinking of LIDAR, which is a pulse type. Calcs distance by flight time, calcs speed by diff of 2 flight times. Seems like this would have a 'blind range' just like radar. Anyway, the target application idea is vehicle detection at a drive-up "post". I've poked around a bit on the 'Net, and haven't come up with a list or table of materials [more-or-less] transparent to this frequency of ~10GHz. I'd need a weather-proof "window" for this outdoor application. Does anyone have any links? I used a plastic enclosure I bought from Radio Shack and it worked just fine Lee if that helps. Following DocJC's comments, I have done a few simple experiments. I stuck some strips of aluminium foil on the blades of a 12v PC fan which I placed edge on in front of my HB100 module in it's pudding basin reflector. I set up my data capture to calculate and display a crude RMS signal value. I also hooked up the amplifier output (i.e. the ADC input) to an oscilloscope. I saw a very noticeable increase in the signal value when the fan was turned on (running off 6v, so not spinning too fast) so I could use this as a 'standard' Doppler signal generator for comparison. I found that placing the polypropylene cover on the pudding basin (i.e. the cover went between the HB100 module and the fan) made no noticeable difference to the signal, which suggest that polypropylene is essentially transparent to 10 GHz microwaves (n.b. I found an interesting presentation on microwave absorption at http://allchemy.iq.usp.br/agregando/wpa/Palestra2.pdf, which also suggests to me that polypropylene is pretty transparent to microwaves, albeit the article is talking about cookers , i.e. 2.5 GHz). Mounting the HB100 the other way round, so it points into the reflector, produced very interesting results. Positioning of the module is critical - just a millimetre change along the axis can make a big difference. In some positions, you see a very high 'noise' signal that swamps the Doppler signal. At other positions you see almost no noise but no Doppler signal either! With careful tweaking you can find positions where the noise is low and the Doppler signal is strong. In this configuration the device is more sensitive than when the HB100 is mounted the other way round, but still the effective distance is only a few metres which is probably too low for a effective vehicle speed measurement. Perhaps a better reflector shape would make enough difference. Hello, thank you all for your info - it helped me a lot. Unfortunately I still have some issues with that module. I did the circuit from the application note with two-stage amplifier on LM324 - everything exactly the same as in application note. When the module is at rest and i don't move the 1st op-amp output oscilates around 2.5V with some noise whch you can see in the first image I attached. Then it goes to the second stage and that noise is amplified and when i still don't move my hand the 2nd stage is changing from 1 to 0 very fast (i think that the noise is saturated). Do you know what's the reason? Did you guys had the same problem and the module behaved the same way with the circuit from the application note? Can you post cirucits which you had implemented? Some of you posted above that had implemented third stage. The module outputs a frequency based on the speed of the object approaching it. The noise you are seeing is quite common and can be from your power supply, and/or the module. Without seeing your circuit or it's schematic it would be mere guesses as to what is generating the noise, and the output you posted. I used some rail to rail, low noise, high speed op amps in my circuit when I built it on a heavy ground plane proto board. At rest there was no out put from the unit as my last stage was a comparator whose threshold was above any noise I might have. Just one note that the module is very sensitive and you can see some pretty good waveforms from it after the first amplifier stage. I attached my schematic, photo of my board and recorded output from 1st and 2nd opamp at rest and when I'm moving my hand (with different power supply it looks a little better now). 1. 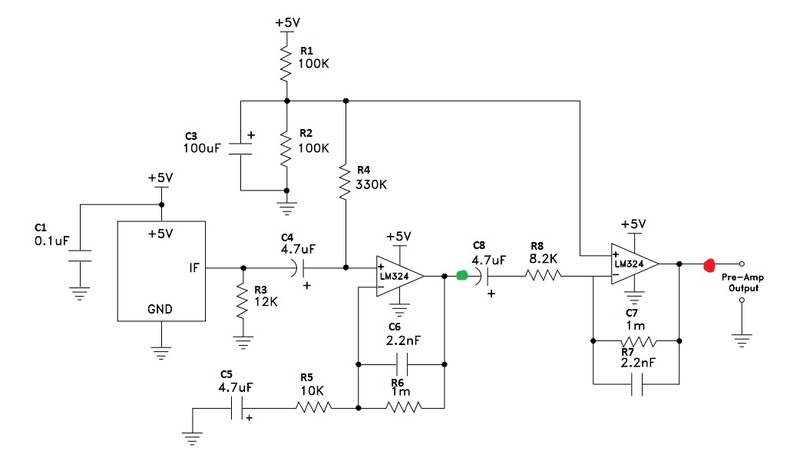 I'm not sure if I understand the schematic, the first stage amplifies the signal x100 and the output looks like a sine with changing frequency. Then it goes to 2nd amplifier and gets amplified by 121 and because signal saturates it looks like square-wave (am i right?) Can you explain me what second stage of op-amp is doing? I think that it makes a square wave , am I right? 2. When I'm checking the short circuit betwen hb100's +5V pin and GND my multimeter beeps - is it normal? (the current which hb100 is taking is low - about 30 mA). 3. I supply the board with 5v cable from ATX power supply, when i check with multimeter the input voltage to the board it's something about 5.1V but when I'm checking the voltage on LM324's Vcc and GND it is about 4.3V - why? 3. How can I improve the circuit to get better output? The HB100 is an X-Band Doppler radar module. Being a Doppler module, the module demodulates the received signal and outputs a voltage that varies with the frequency of the received signal. The frequency of the received signal varies based upon motion of the object the radar signal is bouncing off of, (Google Doppler). So, aimed at a static environment, (no motion in the field of vision), there is "no" output, (i.e. flat signal, biased at whatever voltage). If there is motion in the module's field of vision, then the frequency of the reflected signal changes, and the output signal varies. The amplitude of the output signal is dependent upon the amount of reflected energy received by the module. A large moving object close to the module puts out a larger amplitude signal. The frequency of the output signal depends upon the velocity of the moving object. If the object is moving towards the module, the frequency will be higher, lower if the object is moving away from the sensor. The faster the object is moving, the greater the frequency. 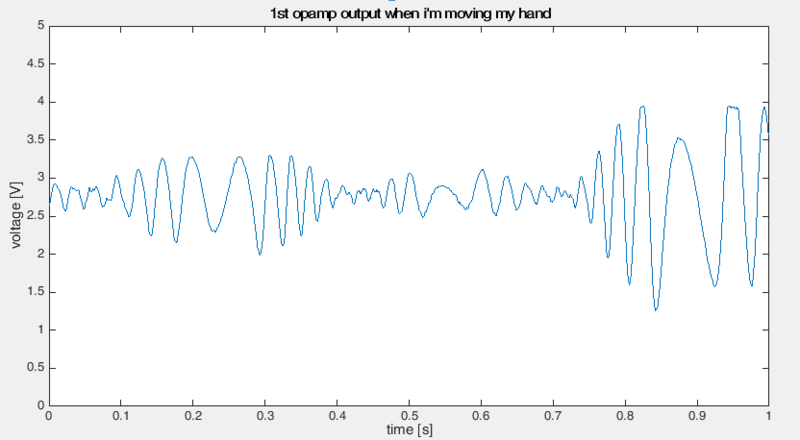 Your moving hand / sin wave output shows this nicely. When you hold your hand still, the output is flatline, as there is no motion. There is still a reflected signal, but no motion of the reflecting object is present. When you move your hand the output is a sin wave. The amplitude varies based upon the reflected signal's strength, the frequency varies based upon how fast you move your hand. You can try your experiment again and move your hand slowly and quickly and you will see the change in the sin wave frequency. That sin wave is essentially the output signal from the sensor that you have to work with. How you process that signal depends upon your intended goal for the project. For a "motion sensor", perhaps as a door opener, or room is occupied sensor, you need to detect the difference between no signal, (flat line), and the presence of a sin wave. The sin wave can be of a varying amplitude and frequency, based upon the reflecting object, its distance from the sensor, and its velocity. For this application an amplifier and LPF or BPF is used to amplify the sin wave and then clip it into a simple digital signal, (all highs or lows). No pulses from the output = no motion. Lots of pulses means there is motion. The digital output is faster and easier for the micro to process that the analog sin wave. If you want to measure the velocity of the moving object, the one has to measure the frequency of the output stream of pulses. If one just ones to know an object is present and moving, the presence of the pulses is sufficient. I have a bunch of LM234 op-amps in the parts drawer. For SOME applications it is a useful chip, with a wide operating voltage range, and the ability to operate from a single supply or a dual supply, (0/5V or +/-5V, for example). If one is running the 324 on a +/- 12V design, there is a wide voltage span where the chip works, still avoid any voltage near the rails. If one is running the 324 on +5/gnd then there is a very narrow operating range for this op-amp, avoiding the rails. Hence, Jim mentioned above using a different op-amp, with a rail-to-rail output. A rail-to-rail output op-amp is linear (functional) over the full voltage range, (or at least very close to the power rails, often within mV of the rails). If the goal is to clip the circuit, and generate a pulse stream of highs and lows, I guess it really doesn't matter if one uses a 324 or a "better" op-amp. If one wants to look at sin wave signal, and view it on the O'scope, or process the signal amplitude with an ADC input on a micro, then a better quality signal amplifier is required. 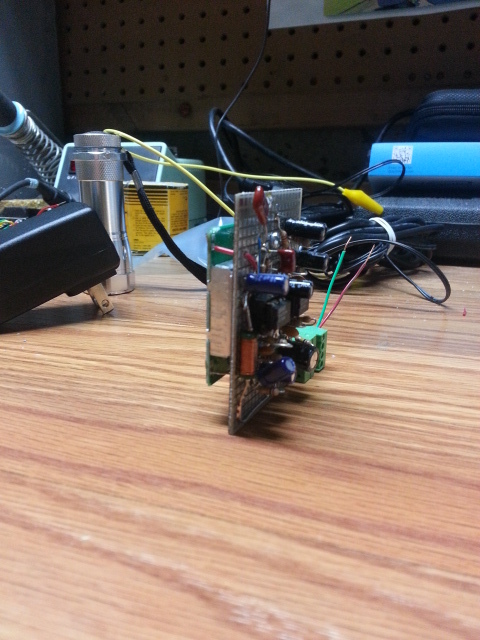 Know that testing a 10 GHz receiver inside, on a workbench, can be challenging. The signal will be reflecting off the ceiling, floor, walls, etc., and will be loading the front end of the receiver with a signal energy that is very different from that which will be present if one mounts the module on the outside entryway, watching for people to approach a door. In this case there is very little reflected energy until a person is present. There will be some reflected energy from behind the sensor, hence the discussion about putting a good reflector behind the module, depending upon what one is trying to accomplish. Anyway, it impacts the internal operation of the circuit, and its operating point, but in theory the output signal is the same. Thank you for your detailed answer. I will try with different op-amp - the OPA2134PA. Right now I'm doing a linear actuator to have a reference speed for tests. If I will have some progress I will post about it. I would also be very glad if someone could answer for my questions in previous post. Ordered one too. Just for the fun of it. 1. 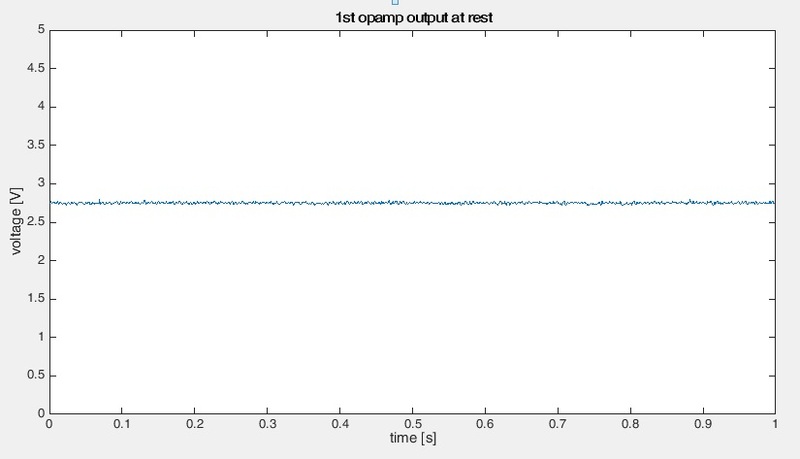 You can see there is some amplitude modulation, so the second opamp stage is overdriven to eliminate that. It is the frequency you're interested in. 2. Why would you measure the resistance of the power pins of the module? If the meter beeps, that's probably a diode test. Nevertheless, the module works, so it must be ok.
3. It's probably not safe to use a ATX power supply. Apart from being noisy and needing a minimum load, they can supply lots of current that can melt your wires and cause a fire. Why do you measure a different voltage? Sounds like a wiring problem. 4. What do you mean by 'better output'? Better in what sense? If you search on the HB100 sensor there is a application note that explains a lot and also has a reference schematic. A lot of things can be wrong, so I think you need to give us more data on what is happening and what your problem is. a schematic and perhaps a photo of your set-up might be not a bad idea to start with, and if you are already using a micro to evaluate then perhaps also that code. Thank you for your attention, and i am sorry if my english language not good enough because it is a foreign language for me. i try to follow the schematic on application note Aigil sense Anex I using LM324 and dc power supply, the result has lot of noise and does not provide 10 Ghz wave as datasheet. You do not get a 10Ghz waveform from the HB100 output. THat 10Ghz is what the module emits for the purposes of detecting an object/gaging it's speed. What you should see from the output of the module is a series of pulses as an object passes through the 'view' of the module. The waveform in your second picture is indicative of a missing ground connection. EDIT: I cannot find a datasheet for an LM342. Do you mean LM324? If yes, that is a terrible op amp for this application. I used low noise op amps from Burr-Brown when I was experimenting with the modules. Keep your connections short, and make sure you have a solid, heavy ground plane.